Personal note: I did not become aware of this revival's existence until May 1995, when some members propounded its legitimacy on the newsgroup rec.heraldry. I soon realized that the more questions I asked, the more confused the answers became, and I engaged in a bit of research on my own. I published this page on September 5, 1996, and have made only minor corrections since. James Algrant's version of events, an excellent and well-informed history. There is a complete online listing of the French knights of that order from 1608 to 1788. I discussed briefly the prior history of the Order of Saint Lazarus. Like the Teutonic Order, it was originally a hospital; and, since it served largely leper knights, it took a knightly character of its own. Like the other orders, it had come to own a number of estates throughout Western Europe, mainly in France, Italy and Spain. Like many other orders, it fell into obscurity after the loss of Acre in 1291, but survived as a collection of commanderies and hospitals, managed by a Grand-Master located at the commandery of Boigny near Orléans, France. In 1459 Pius II united the Order of Saint-Lazare with his new creation, the Order of Our-Lady of Bethleem, but the bull was not implemented. In 1489, Pope Innocent VIII, intent on launching a crusade after the fall of Constantinople, tried to bring about a more rational use of existing resources and ordered the Order to be merged with the Order of Saint-John in Rhodes. The papal bull met with resistance: the knights of Saint-Lazare in France resisted it and continued to elect their own Grand-Masters (Francois d'Amboise in 1493, Agnan de Mareul in 1500), and over the following years legal attempts by the Order of Saint John to take over the estates of Saint Lazarus failed; in particular, a decision of the Parlement of Paris (a judicial court) in Feb 1548 rejected the validity of the bull. Meanwhile, in France, the Grand-Mastership had fallen in the hands of the Mareul family (Agnan, then Claude from 1519 to 1554), which tried to turn it into a hereditary position. The Concordat of 1516, which settled the relations between the Papacy and the French crown, prescribed that appointments to clerical positions would be made by the king subject to papal approval, and the commandery of Boigny fell into that category (it was considered a clerical position in spite of the fact that knights were married). In 1519, Agnan resigned his position as commandeur de Boigny in favor of his 16-year old nephew Claude, a curious move which the Pope nevertheless confirmed by a bull of June 1519 (Gautier de Sibert claims that the bull also confirmed his appointment as Grand-Master of Saint-Lazare, but some authors dispute that). In the following years, the French king continued to appoint Grand Masters (without papal approval), although the order was only composed of a dozen knights. It should be noted that every one of the four Grand-Masters between 1557 and 1604 were knights of Saint-John of Malta. The Popes still hoped to regain control of the order's resources. Leo X reestablished Saint-Lazarus in 1517 with the preceptory of Capua at its head, and Pius IV attempted to appoint his own Grand Master in 1565, without success. Finally, in 1572, Pope Gregory XIII ordered Saint Lazarus to be merged with the Savoyard order of Saint Maurice and turned over the Grand Mastership to the duke of Savoie, the Spanish estates of the order being reserved for the king of Spain (see the subsequent history of the Order of Saint Maurice and Lazare on that order's website). This was effected in Italy, and, initially, the French king Charles IX accepted the decision, issued to the duke of Savoy a "brevet" (Jan 15, 1574) entitling him to seize the estates. Henri III succeeded as king the same year and issued another brevet (Mar 30, 1575) which ordered the current Grand Master, Francesco Salviati, to hand his resignation, which Salviati did. But he later persuaded the king to change his mind, suggesting how dangerous it was to turn over estates to a potential rival like the duke of Savoy. Henri III reversed himself, revoked the brevet and asked Salviati to return to his former position. From 1572 onward (in fact, since 1489, with the possible exception of Claude de Mareul in 1519), the Pope never confirmed any French nomination to the Grand Mastership. The French branch continued, while the Italian branch was merged with Saint Maurice. By 1608, the French branch counted 7 knights only. In 1604, Henri IV nominated a close friend and loyal supporter, the marquis de Nérestang, as Grand Master. Nérestang, however, was eager to be in good standing with the Pope, and asked for papal approval; something the Pope refused, since the Grand Master was the duke of Savoy. A clever solution was found: in 1607, Henri IV created a whole new Order, called Ordre de Notre-Dame du Mont-Carmel, with identical statutes and emblems as Saint Lazarus (the only difference being the color of the cross, purple instead of green), and appointed Nérestang as Grand Master. The Pope gladly approved that creation as a manifestation of Henri IV's Catholic faith and accepted the rule of the new order on February 26, 1608, and the nomination of Nerestang as Grand-Master of the new order on April 4, 1608 was also approved. As soon as the papal bulls were received, Henri IV united the orders of Saint Lazarus and Notre-Dame, on October 31, 1608. The text of the "brevet" states that all the estates of the order of Saint-Lazare are turned over to the Grand-Master and the knights of the new order to use as if they were knights of Saint-Lazare. The Pope tacitly accepted this disposal of the estates of Saint-Lazare (and, on June 5, 1668, they were confirmed by the cardinal of Vendôme, papal legate a latere in France); but he never recognized the Grand-Masters appointed by the French Kings to be anything else than the Grand-Master of Notre-Dame du Mont-Carmel (e.g., Charles-Achille de Nerestang by brief of Dec 1645, Dangeau by bull of Apr 28 1695, the duc d'Orleans by brief of Dec 17, 1720). To this day, the Papacy sees the head of the House of Savoy as the sole Grand Master of Saint Lazarus. As "the united orders of Saint-Lazarus and Notre-Dame du Mont-Carmel" the order prospered modestly under a succession of appointed grand-masters, with occasional vacancies. The Grand Mastership remained in the Nérestang family until 1673, during which time the order was also given a maritime vocation, arming a few ships to participate in Louis XIV's wars, in a vague imitation of the order of Malta's galleys. Various hospitals were turned over to the Order in 1664, followed by the properties of various religious hospitaller orders in 1672, further enriching the order. The Order's total income around 1690 was close to 300,000 livres, and the 173 commanderies averaged 1500 livres in income, a large enough sum on which to live comfortably. The order's knights were allowed, by papal privilege, to collect ecclesiastical revenues attached to their estates as if they were priests. The commanderies were granted for life by the king himself (declaration of 1680) and were used to pension retired officers and disabled veterans. The number of appointments consequently grew: 26 between 1620 and 1644, 163 in 1644-73, 600 in 1673-91 under Louvois (1673-1691; technically never Grand-Master but Grand-Vicar, because the Pope refused to approve his appointment). A number of these appointments were knights of grace, for whom the nobiliary requirements were waived. Philippe de Courcillon, marquis de Dangeau, Grand Master of the Order of St. Lazarus and Mount Carmel, by Hyacinthe Rigaud. 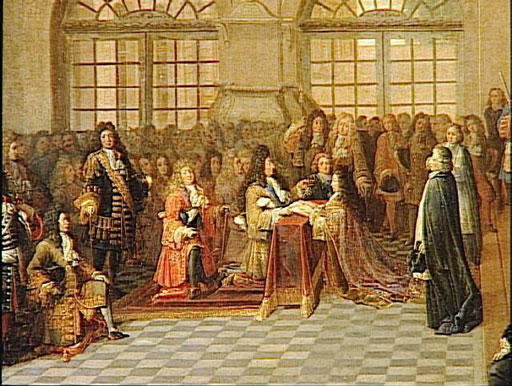 Louis XIV receives the oath of Dangeau as Grand Master, 18 Dec 1695, by Antoine Pesey. The Order changed nature once more after Louvois. It ceased to be a veterans benefits administration when, in 1693, the properties of 1664 and 1672 were taken away, and only 13 commanderies remained. The next Grand Master, Dangeau, turned the Order into a money-making machine by selling knighthoods to whomever could pay (the "passage fee", originally 300 livres, was raised to 500, 600 and later 1000 livres) and appointing hundreds of knights, knights of grace, and serving brothers. He invented hereditary commanderies, essentially selling a hereditary knighthood in exchange for enough money to endow a commanderie: if more than 1,000 livres was paid, the commanderie was hereditary, otherwise it could be transmitted once. Government bonds were acceptable in lieu of payment. A total of 51 were thus created between 1700 and 1757. In all, 236 knights were appointed under Dangeau (1693-1720), and 175 from 1720 to 1745 under the mastership of the duc d'Orléans (1720-52). As of 1741, the order had 591 members, of which 440 knights. In 1742, the pious duke retired to a convent and lost all interest in the management of the order, and no appointments were made; it was even thought that he intended to let it disappear. The orders' maritime activities (up to 10 ships) ceased after 1748. After the duke's death in 1752, the order was without Master for several years. Jetton with the arms of Louis d'Orl�ans, Grand Master of the Royal Military and Hospitaller Orders of St. Lazarus and Our Lady of Mount Carmel. Source: Compagnie G�n�rale de Bourse, Paris, France. In 1757, Louis XV appointed his 3-year old grandson the duc de Berry (future Louis XVI) as Grand-Master, and made himself Protector of the Order. He also reformed the statutes of the Order: the only members were to be knights, limited to 100 (plus 8 clerics), aged 30 or more, Catholics, and 4th-generation nobles in the male line, on payment of a fee of 1000L. The Order was to be primarily for former state employees (including the diplomatic corps). Hereditary commanderies were abolished, and the estates to be returned to the families. The only officers of the order were to be a herald and two ushers (who were not knights). He also allowed the possibility of nominating alumni of the Royal Military Schools, even if they were under-age, as long as they fulfilled the religious and nobiliary requirements, and entitling them only to the bearing of reduced-size insignia (they were called novice knights; about 80 were appointed in the next 12 years). A papal bull of December 10, 1772 settled a long-standing controversy over ecclesiastical benefices of the order of Saint-Antoine which had been handed over to the (lay) knights of Saint-Lazarus. The latter were deprived of the rights to enjoy such benefices. This bull has been incorrectly called a secularization of the Order: the Order remained under Papal jurisdiction. Also, a regulation of March 1773 strengthened the nobiliary requirement to 8 degrees of nobility, making it more exclusive and thereby more desirable. The Order was once again changing its nature. Berry had become Dauphin in 1769, and in late 1773 the mastership passed to Berry's brother the comte de Provence (future Louis XVIII). Jetton with the arms of Louis-Stanislas-Xavier, fils de France, brother of the king, Grand Master of the Royal Military and Hospitaller Orders of St. Lazarus and Our Lady of Mount Carmel. The arms are quarterly France a bordure indented gules and argent a cross vert, cross and collar of the order, mantle, crown of a prince du sang, and the motto Atavis et Armis on a scroll. The date 1773 refers to his installation as grand-master, not the date of the jetton which must date from after 1774. Source: Compagnie G�n�rale de Bourse, Paris, France. Provence seemed interested in the Order as a source of favors to hand out. In 1785 he suggested to the king that the Order was really a "mark of nobility, the insignia of a sort of noble association and not a courtly reward." He wanted to capitalize on the recent surge of prestige to turn it into a rival of the Order of Malta: at least, he argued, Saint-Lazare does not require celibacy, and its head and sovereign protector was the king himself, not some foreign entity. It would also serve as a source of retirement income for officers, and thereby relieve the Royal Treasury. Provence's apparent altruism should not deceive: he wanted to turn the Order into his private Saint-Esprit or Golden Fleece, and use it as a source of extra revenues for his uncontrollable spending habits (the Royal Treasury had to bail him out of several millions' worth of debts in the mid-1780s, at taxpayer expense). Not surprisingly, his brother the king was not receptive. Besides, the order was losing money as it was. In 1788, the king and Provence decided to let the order disappear by ceasing to appoint knights (see Petiet 1914). Accordingly, the last promotion was in 1788. Also, a regulation of January 21, 1779 limited the Order of Notre-Dame du Mont-Carmel to be awarded on its own to the three best students of the École Royale Militaire. But the School was abolished in 1788, so that aspect of the order was also condemned to disappear. A total of 50 knights had been appointed from 1757 to 1772, and 82 from 1773 to 1788. The average age of appointees under Provence was 43. The Revolution came, the comte de Provence fled the country in June 1791; the order was abolished along with other orders on July 31, 1791, by a decree of the National Assembly signed by the king, and the estates confiscated and sold. While in exile, it appears that Louis XVIII handed out a few crosses, almost only to foreigners (one Pastou de Boussas claimed to have received it in 1791 in Koblenz). Paul I of Russia, fond of decorations and at the time eager to take Malta under his protection, was given a grand-cross in 1799, as well as his two sons in 1800. The same year Provence offered 20 crosses to Russians of the Czar's choosing (in fact, he offered the Czar as many crosses as he wanted), and also gave crosses to the baron of Dreisen and the baron of Fersen who were his hosts in Mittau: this, of course, in spite of the Order's restriction to Catholics. The following year the Czar expelled Provence from Mittau. No other appointments are noted until Provence's return to France as Louis XVIII, when, allegedly, he appointed a Le Prevost de Basserode in July 1814 and a de la Brousse in August 1814 (all these names come from Paul Bertrand's book; there is no proof of these appointments, and the individuals in question were unable to ever obtain recognition). Only the nomination of the baron of Dreisen seems to have been more widely known, and even then it is considered an honorary knighthood. A certain ritual had to be followed for the reception of a knight, in the presence of the chapter of the Order, and it is doubtful that Louis XVIII went through that trouble in Mittau. Furthermore, the statutes excluded non-Catholics; thus, the Russian nominations (including Dreisen) can at best be considered honorary. In practice, they were baubbles which was almost the only reward that the penniless Louis XVIII could afford. The Bourbons returned to France in 1814, and Louis XVIII, while preserving Napoleon's Legion of Honor, proceeded to recreate the Old Regime's orders. The Order of Saint-Esprit was recreated on September 28, 1814 and promotions made during exile were validated; the order of Saint-Louis and the Mérite Militaire (the Protestant version) were likewise recreated on Dec. 12, 1814 and even Saint-Michel was restaured on November 16, 1816. But nothing was done to reinstate Saint Lazare. Louis XVIII kept wearing the star of the Order (and was buried with it) but otherwise showed no interest whatsoever in the order. It is true that the order had lost its estates, and had therefore no income whatsoever. Caring for the order would have meant allocating funds, as had been done for the other orders. But Saint-Lazare had been a very minor order, and clearly Louis XVIII saw no need for it anymore. Moreover, the old statutes, with their nobiliary requirements, were incompatible with equality of access to official positions promised by the Charter of 1814. The order would have had to be reformed: since the French monarchy already had more than enough decorations and awards of merit, there was no need to bother about Saint Lazarus. Louis XVIII had already decided to let the order whither in 1788, and he did not revise his position. All requests for appointments were turned down by his government, with the explanation that Saint Lazare is not confered anymore. Worse than that: on April 16, 1824 a royal ordinance outlawed the use of decorations except for the French royal orders or with royal authorization. An instruction of the Chancery of the Legion of Honor of May 5, 1824 specified which 6 orders were royal for the purposes of the royal ordinance: Saint-Esprit, Saint-Michel, Saint-Louis, Mérite Militaire, Légion d'Honneur and the united Saint-Lazare and Notre-Dame du Mont-Carmel. Concerning the last order, the instruction said, no new appointments have been made since 1788 and "on le laisse éteindre" (we are letting it disappear). Knights who claimed to be members of the order had to obtain a certification from the Ministry of the Royal Household before they could even wear their insignia, but that Ministry had no record of any appointments and made no certifications. Clearly, Louis XVIII was letting the order die. This would not take very long: the youngest knight was born in 1757. 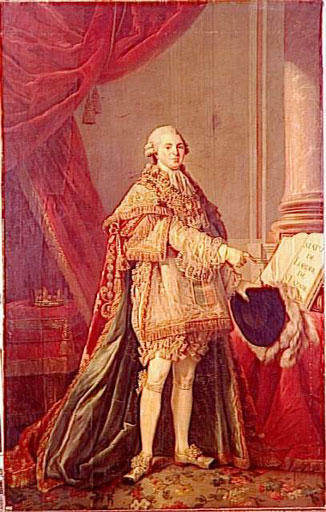 Louis XVIII himself died in September 1824, and his successor Charles X, although very nostalgic of the Old Regime, showed no further interest in the defunct order. He was overthrown in 1830, and the Order of Saint-Lazare was abolished along with the Saint-Esprit and Saint-Michel a few months later; not only was it not awarded anymore, but it lost its status as a legal order, and its surviving members could not wear its insignia anymore. It is not correct, however, to state that the Order lost its protector in 1830: the protector had forsaken the order in 1788, and never looked back. At that time, it is claimed (Dictionnaire des Ordres de Chevaleries, Migne edition) that a small group of surviving knights had formed a council of 14 surviving knights in 1816, led by the duc de La Châtre (1745-1824). Paul Bertrand, in his history (1932), names the council as it stood in 1830: the list of seven names contains only two verifiable knights, the comte Pierre-Jean-Levi d'Albignac de Montal (1739-1829, knighted 1783) and Jean-Louis de Beaumont, marquis d'Autichamp (1738-1831, knighted 1783). Two other "knights" (Ch-J-B des Courtils de Bessy and Ch-Ed. de Bailleul de Vattelot) claimed to be so by "hereditary right", presumably a reference to hereditary commanderies (François de Bailleul had founded one in 1702 and Jean-Baptiste-François des Courtils de Bessy had founded another in 1711; those two hereditary knighthoods are still claimed today by the Croÿ and Courtils families). But, as we saw, the statutes as revised in 1757 had abolished those commanderies, and no such "hereditary right" existed; the claim that such commanderies still exist and provide a link to the present is an imposture. The council also included three individuals who had been officers (but not knights) of the order before 1789: a chaplain named Picot, the historiograph Bon-Joseph Dacier (1742-1833) appointed in 1787, and the herald, Augustin-François de Silvestre (1762-1851) appointed in 1784. Nothing further is known about the activities of this council. Given the age of the last remaining members, it cannot have survived very long. Very few knights were still alive in 1830 besides Beaumont d'Autichamp: Jean, baron de La Rochefoucauld-Bayers (1757-1834, kt 1788) was paralyzed by a stroke in August 1830, Gaspard-Paulin de Clermont-Tonnerre (1753-1841, kt. 1788), Louis-Philippe de Ségur (1753-1830, kt 1784) died on August 27, Nicolas-Auguste de Grimouard-Beauvoir (1753-1843, kt 1784), Charles-Henri de Maillé (1755-1845, kt 1779), Antoine Charry des Gouttes (1754-1857, kt 1788). The latter was the last surviving knight of Saint Lazarus. In his 1960 book, Bertrand claims to have found evidence of appointments by Louis XVIII after the Revolution. All the names come from one source: the Almanach Royal was a privately edited directory of French officialdom. Members of knightly orders saw their names followed by a indications of their decorations. Every time a name was followed by the designation of Saint Lazare, and could not be found on the list of knights up to 1788, Bertrand counted that name as a post-1788 nomination (even when it was a typo corrected in later editions of the Almanach!). But the Almanach also printed a list of existing knights of Saint-Lazare, and none of these alleged nominations appear in that list; indeed, the list always conforms to the official lists of nominations stopping in 1788. Bertrand thinks he found an exception: in the 1829 edition, two names appear in that list without a date of nomination, and Bertrand sees those again as post-1788 nominations. But the names are Polignac and Steguer, and both were appointed in 1788. Thus, Bertrand's "evidence" is a list based solely on typographical errors. After 1830, no information on any Order of Saint Lazarus ever appears publicly until about 1910, even in the official histories of the modern order. These claim that "the order" turned to a Melchite Catholic patriarch for protection, on the basis that the patriarchs of Jerusalem were also the protectors of the order in medieval times. It should be noted that there are currently three patriarchs of Jerusalem, so there is plenty to choose from. Here's a brief history. In the Byzantine empire, when the monophysite doctrine split the Orthodox Church in the 5th and 6th centuries, those Christians who remained faithful to the Emperor received the name of melchites (from the Arabic for king). The monophysites formed their own churches, which still exist (Coptic in Egypt, Jacobite in Syria), with their own patriarchs. There were thus monophysite and Melchite patriarchs of Antioch and Alexandria (although only a melchite patriarch of Jerusalem, since monophysitism never took root in Palestine). During the Crusades, the Melchite patriarchs fled to Constantinople, and the Pope established a Latin Catholic patriarch (the one who presumably protected the religious orders) but that patriarcate disappeared with the Latin kingdoms and the Orthodox patriarchs returned to their sees. In the 18th century, some Melchites decided to unite with Roman Catholicism while retaining their rite: they became known as Catholic Melchites, and designated their own patriarch, but, being few in number, one sufficed for Antioch, Alexandria and Jerusalem (1838). But in 1847, the Pope created a (Latin Catholic) patriarch of Jerusalem (the 3d by that title) to administer the few Latin Catholics in Palestine. For some reason, that one did not interest the revivers of Saint Lazarus, and they prefer to place themselves under the protection of the Melchite Catholic patriarch, apparently because the Sultan appointed him to some civil duties under the Ottoman rule. At what date, and by whose decision the supposedly surviving order of Saint Lazarus went to the Orient, is not said in the official histories of the revived order. It is presumed that it happened sometime after 1838. In his first history of the order (1932), Paul Bertrand is able to name but one knight between the 1820s and the 1910s: Anselme de la Puysaye, with no date for his alleged entry into the order. The order disappears completely, and Paul Bertrand's history, hitherto full of names and details, becomes obscure. (The only reference cited by Paul Bertrand for the history of the order in that period is the book on orders of chivalry published in 1913 by Frédéric Guigue de Champvaus, on whom see below). In the second history that he wrote (1960), Paul Bertrand presents the results of 30 years of research. The archives of the order had been lost, and he relied on other sources to find names of knights: mentions of the order in biographical dictionaries or family monographs, even the presence of the cross in painted portraits. None of this is very serious. Several names come straight from an article by Adriano Colloci-Vespucci (1855-1941), retired politician and amateur heraldist, in the Rivista Araldica in 1937, which is apparently without references. All in all, he comes up with less than a dozen names, all of them French aristocrats, which is rather curious for an order based in Jerusalem. A number of them are associated with French legitimist circles. The question of who went to the Patriarch of Jerusalem and at what date remains unanswered. A 1965 brochure of the order gives a date of 1841 for a visit of the Patriarch to Paris, without reference or details. In short, the history of the order between 1830 and 1910 is obscure, for the simple reason that the order did not exist. The present-day order is, nowadays, more cautious, and only alleges a "tradition" that the order survived, and admits to having no proof. The thread seems to pick up in 1910. At that date, the Greek melchite patriarch of Jerusalem had just been "forced" to resign as Grand Master of the Supreme Militia of Jesus Christ. This organization had started in 1870 as a group of former soldiers in the Pope's army, discharged after the capture of Rome by Italy. In the mid-1880s, the association tried to turn itself into an order of chivalry; rebuked by the Dominicans to which they were initially connected, they turned in 1900 to the Greek melchite patriarch of Jerusalem. A stern warning from the Pope quickly decided the patriarch to "resign" the Grand-Mastership (to use the terms of Bertrand). Then, according to the official historians of the revived order, in 1910, the Patriarch asked "the almoner of the Order of Saint Lazarus", a Polish chaplain named Tansky, living in Paris since 1870, to revive the order; the chaplain being also a member of the Militia of Jesus-Christ, got in touch with a fellow member of that Supreme Militia, a Frenchman by the name of Paul Watrin, who is made "Chancellor" of the Order. Watrin is the key public figure in the revival. Paul Watrin (1876-1950) of an Alsatian family, studied law, was admitted at the Paris bar in 1899, and married in 1903. He also pursued further studies, getting a doctorate in political science with a 1916 thesis on "the Monarchical Tradition" (reprinted in 1983). This work was in fact important, because it laid down the theoretical foundations for French legitimism (a variant of royalism which refuses to support the Orléans claims to the throne of France, and has turned since 1883 to the Spanish Borbóns). In particular, Watrin considered royalist claims from the point of view of Old Regime law, and denied the validity of the Utrecht renunciations. Watrin was also active politically, and in 1911 co-founded the Union Française, an ephemeral extreme-right organization. He also became a member of the Order of the Militia of Jesus-Christ in 1902. This is quite consistent with his political views: during the late 19th century, the more zealous French legitimists who, after the grotesque failure of the Vendée uprising in 1832, had no outlet for their fighting ardor in France, turned to Italy and enrolled in the Pope's army to pursue the fight against liberalism, secularism and other such evils. The Militia was founded in 1870 as, in effect, a veterans association of the Pope's army, where anti-democratic and ultra-Catholic feelings were probably strong. At some point, Watrin entered the Société arch�ologique de France, a scholarly society founded in 1816, which had a distinguished past but had turned into a moribund antiquarian association. In 1905 both the positions of president and the secretary of the society became vacant, and in 1907 Watrin became president, and a man named Paul Bugnot became secretary. They quickly acted to turn it into a vehicle for their political and nobiliary activities. In 1910 the association named Alfonso de Borbón (1849-1936, uncle of the Carlist pretender) as its honorary president, hailing him as "son of Jean III, brother of Charles XI, uncle of Jacques I, first prince of the blood". Around 1910, an association called the Noble Hospitallers of Saint Lazarus of Jerusalem is formed (at some point, it was registered as a non-profit association under the terms of the French Law of 1901). Who founded it is not quite clear. The official histories of the revived order claim that the Greek Melchite patriarch Cyrill VIII "transferred the Order" to Paris in the care of Watrin who became its Chancelor. It is clear that he was one of the founders, and that this enterprise was closely associated with the Société which he presided. Perhaps Tansky provided him with the idea of placing the new order under the Patriarch's protection. Initially, the Société had its "Lauréts" who were "entitled" to wear an insignia in the form of a radiant star, suspended from a golden collar. Later, the cross became a Maltese cross of white enamel. Perhaps this was the origin of the Order of Saint Lazarus. The publication of the Société, the Bulletin historique, archéologique et héraldique, was the official mouthpiece of the revived Order. From 1911 to 1913, it published the announcement of admissions of "knights". Initially, the Order was called Chevaliers Hospitaliers de Saint Lazare et de Notre-Dame de la Merci, though this added name was dropped after World War I (Notre-Dame de la Merci seems to have evolved into its own dubious order in the 1930s: see an article by the ubiquitous Demeter de Ser Leo in Rivista Araldica, ???). Besides Watrin, we find the name of Paul Bugnot, who was secretary of the Société since 1907, and who called himself Judge of Arms of Saint Lazarus, as well as Secretary of the Order of the Advocates of Saint Peter and Judge of Arms of the Berlin Chapter of the Royal Order of Saint John Baptist. I have not identified the latter, but the Advocates of Saint Peter are described in an article by Charles Mounier in Rivista Araldica (1910, pp.172-4): created as a professional association of lawyers in Rome in 1877, it was transformed by a Pierre Lautier into an order of chivalry, with cross, knights (for 150F or 500F) and commanders (750F). Paul Bugnot resigned from Watrin's Société in the early 1920s for health reasons. Another figure is the "comte Frédéric Guigue de Champvaus", an active member of Watrin's Société which published his book on Orders of Chivalry in 1913. He styled himself representative of the Order of Saints Cyril and Method, Secret Cameriere of the Pope and Prince of Carency. His real name was Fritz Hahn, born in 1881 in Vienna. Another associate was called Baron Moeser, or Jacoby de Moser, or Moser de Veyga, or even count of Montecristo, also a member of Saint John Baptist, Saints Cyrill and Method, president of the Chapter of Saint Lazarus. His real name was Rotschild, and he was originally from Germany. For the 1910s, I have found only a handful of members: Tansky, the Polish chaplain and only link to the Order's supposed Oriental period, who dies in 1913; Anselme de la Puisaye, a former soldier in the Papal Army, probably another member of the Militia of Christ; Watrin himself; Alexandre Gallery de la Tremblaye, a bank manager at the Crédit Foncier de France and second cousin of Watrin's wife, received in 1911 and made "keeper of the seals"; and Charles Otzenberger, an Alsatian wine dealer, also received in 1911. Otzenberger would come to play a major role in the Order, but it seems to me that he did not do much initially, as he was living in Colmar (Alsace) and Barcelona. In 1913, a much-amused marquis de Jandriac publishes in Rivista Araldica (pp.679-83) the Fundamental Statutes of the Order. The statutes specify that the knights must be Catholics, of noble origin, and must contribute to charitable causes in the Holy Land. All donations are centralized through the Chancelor who (supposedly) funnels the money to the Patriarchate. The Order's activities halted in 1914. This may be due to the war. More likely, it is due to the fact that Moser and an accomplice named Hans Branco were both arrested in Paris for trafficking in fake orders and decorations. Moser had apparently gone too far and started selling fake Legion of Honor medals. He was sentenced to 4 months in jail, after which he returned to Berlin and committed suicide in 1928. The offices of the Société were searched by the police and many diplomas, crosses and various insignia were found. This probably put a damper on the Order of Saint Lazarus. By a strange coincidence, Fritz Hahn alias Guigues de Champvaus was jailed in 1936 in Paris for illegal sale of order and decorations! What exact relationship there was between Watrin, whose main interests seemed to have been political, and this pair of crooks, is not clear to me. Moser is never mentioned in the documents of the Société, but it is known that the Société was searched by the police after his arrest. Hahn's association with the Société is documented. Was Watrin aware of the fraud, or was he hoodwinked by them? It's hard to imagine that he was a simple victim. In any event, although the two crooks drop out of the Lazarist organization around 1914, Watrin himself stayed on until 1929 and provides an irrefutable link between the 1910 events and the present-day order, even if the latter tries to distance itself from its shady origins. Watrin not only stayed on, he remained the leader. In late 1920 the Société reconstitutes itself, still under his presidency (indeed, its address and its meetings are all in Watrin's home, 326 rue Saint-Jacques), and launches in 1921 a periodical called La Science Historique. In its first year, that periodical announces that "chivalry will hold an important place in la Science Historique, where we intend to do history in the context of current news". In fact, the publication has no scholarship, and is mainly devoted to articles on nobility, titles, monarchy; its views are vehemently legitimist, and the occasional anti-Semitic article slips in. The first issue includes an article on the Order of Saint Lazarus, briefly tracing its known history, then mysteriously alluding to its survival in the Orient independently of the Italian and French branches; "in their last state, we find the Noble Hospitallers of Saint Lazarus of Jerusalem under the protection of HB the Greek-Catholic patriarch of Antioch, Alexandria, Jerusalem and all the Orient". The order has granted to la Science Historique the privilege of publishing the proofs of nobility for new members of the order. In fact, in 1921 three members are admitted: Fernand de l'Église de Ferrier de Félix, who is made judge of arms; José Luis Pablo Viladot y Sala, a parish priest in Berga, near Barcelona; and Gérard de Collardin y Esser, a chemist living in Barcelona. All three also become members of the Société, as does Otzenberger in 1921. Therefore, all known knights are also members of the Société. From 1922 to 1926, no new knights are announced, and the Order goes unmentioned, apparently completely inactive. The Société, in the meantime, restricts its full membership to people of French stock ("français de race") and appoints a genealogist to inspect applicants' racial background. (It has about 10 full members, and 80 corresponding members, many of whom are foreigners). Its articles continue to include violent attacks on the Orléans family. In 1925, Otzenberger marries Germaine Detaille, changes his name to Otzenberger-Detaille and moves from Colmar to Paris, 75 rue Blanche, where he starts selling machinery to Romania and Yugoslavia, dealing also with Latin American countries. Coincidentally, the Order's activities pick up. The Council of Officers (namely Watrin, Gallery and l'Église) meet at Watrin's home on June 10, 1926 and apppoint Otzenberger as "greffier" (recorder) and Arsène Attié, archimandrite, priest of Saint-Julien-le-Pauvre in Paris, as almoner; this last gesture probably a preliminary step for what follows. The next month, Cyril IX, new Melkite Catholic patriarch of Jerusalem, visits Paris, and celebrates a mass at Saint-Julien with Watrin, Gallery, Otzenberger, and Attié the connection with the Patriarch, source of "legitimacy", is re-established after a 16-year gap. In 1927, two new knights are admitted: Maurice Dreux, knight of the Holy Sepulchre (who died in deportation camp in WWII), and Paul Bertrand, legal assistant in the Merchant Navy administration and mediocre amateur playwright (1895-1977). The same year, Paul Bertrand publishes in la Science Historique a short history of the order and sends a copy to the Pope via an acquaintance in the Vatican. The Pope politely sends back his blessing, and the book is then proclaimed as "having received the apostolic benediction of HH Pope Pius XI". Bertrand's article explains the criteria for admission, and insists that, while no initiation fee is required, the new knight must make a substantial commitment to charitable causes in the Middle East, through the Order's intermediary of course! In 1928, further knights arrive: Émile Bertrand (b. 1866, Navy captain, father of Paul), Yvan Bouchard de la Poterie, René du Rot, Olivier de Pompery de Couvrelles (b. 1865), Paul Watrin's son Jacques (b. 1903), and the American architect William Francklyn Paris (1871-1954), founder of the American Association of the French Legion of Honor in 1922. That year, l'Église becomes president of the French association of the order (after the order decided that an association could be formed in any country with 5 or more members), and Paul Bertrand replaced him as judge of arms. Eight members of the order celebrated the feast day of Saint Lazarus on Dec. 17, 1928. Activities pick up: the members of the order make for themselves superb white uniforms, they get decorations from a jeweler specializing in orders at the Palais-Royal, and start appointing people right and left. In 1929, some changes take place: Watrin steps down as Chancelor and the statutes are rewritten. It appears that Watrin had a fall-out with his associates, and disapproved of the fancy uniforms and pompous titles which they were introducing. In fact, he continued with his own order of St Lazarus, with a single class of knights. Within a few years, Watrin's La Science Historique publishes a warning in each issue against the other Order. The council of officers now consists of Arsène Attié, Grand-Almoner; Paul Bertrand, Grand-Chancellor; Otzenberger-Detaille, Superintendant; Gallery de la Tremblaye, Keeper of the Seals; Émile Bertrand and l'Église de Ferrier de Félix, members. The seat of the order is transferred to Paul Bertrand's home 7, rue Cassette. More members are admitted in the same year: Joseph Stillemans, a Belgian parish priest in New York state and domestic prelate of the pope in 1919; Roger Bellot des Minières; Xavier Fournier de Bellevue, cavalry captain and member of the Société since 1920; Charles Laudet, diplomat; Victor James Dowling (1866-1934), judge of the New York Supreme Court 1905-31; William Dameron Guthrie (1858-1935), law professor at Columbia University; George MacDonald (� 1940), chairman of the Nassau Suffolk Lighting Company. The three Americans (as well as Laudet and Fournier de Bellevue) are members of the papal order of Saint Gregory. Unfortunately, in 1930 the Greek Melchite patriarch is informed that French law has little tolerance for fake orders, and he hastily resigns his Protectorship of the revived order. But not to worry: the real coup comes when the Council of Officers, "with the concurrence of the Archbishop of Acre as well as that of the hereditary commandery of La Motte de Courtils" manage to convince Francisco de Borbón, of a morganatic branch of the Spanish royal family, duke of Seville by right of his wife (1882-1952), to become Lieutenant-General of the order in May 1930. Located in Spain, the duke seems happy to turn over the management of the order to the Parisians. In 1932, the order, whose seat is now Otzenberger's home, publishes an expanded history by Paul Bertrand with splendid pictures of the members. 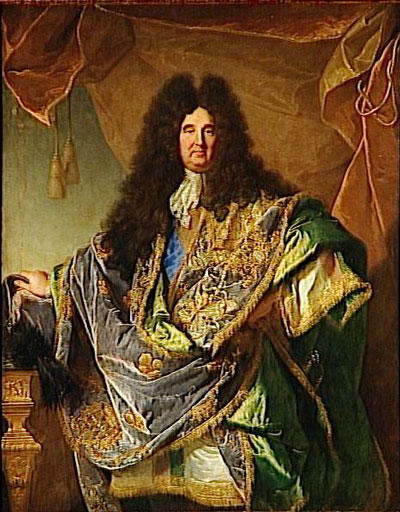 By then, Otzenberger-Detaille is called "His Excellency the Superintendant General", L'Église de Ferrier de Felix and Fournier de Bellevue are called marquis and Pompery de Couvrelles a vicomte; another member who is mentioned is the "marquis" de Digoine de Palais (although the titles are fanciful, the names are those of authentic French nobility). The almoner of the order is now the archimandrite Demetrius de Ser Leo: sadly, that man was apparently sentenced to 6 years in jail by a military tribunal in Rome in 1937, for traffic in illegal orders and decorations, namely an Order of Saint-George of Burgundy; proving, if it was necessary, that the order remained associated with shady characters long after its 1910 birth. In June 1933, the duke of Seville, who has fled Republican Spain, is hosted at a dinner at the Hotel Iena in Paris. To replace La Science Historique, a new periodical appears in April 1933 under the editorship of Paul Bertrand, La Vie Chevaleresque, to be the official mouthpiece of the order. The new periodical chronicles the fabulous expansion of the Order. In December 1935, the duke of Seville is elected Grand-Master of the Order. Presumably, the duke's royal connections (he is a member of the Spanish royal family) impresses Spanish-speaking applicants, and the Order becomes linked with a number of Latin American diplomats in Paris. Otzenberger is even made consul of the Dominican Republic in Mulhouse (!). The order's ideological slant was quite visibly inherited from Watrin's original legitimism: the duke of Seville himself is a colonel in the fascist Falangistas. The handing out of crosses confirms the political inclination: between 1933 and 1936, the following individuals become members: Francisco Franco (dictator of Spain 1936-75), Carol II of Romania (king/dictator of Romania 1930-40), Rafael Trujillo (dictator of the Dominican Republic 1930-52), Fulgencio Batista (dictator of Cuba 1933-44, 1952-59), Getulio Vargas (dictator of Brazil 1930-45), and a few other presidents of Latin American countries (Argentina, Peru, Honduras, Guatemala). Whether every one of these distinguished gentlemen was actually aware of his membership is not quite clear: the Order occasionally bestowed its cross on unsuspecting individuals, as happened to the Mexican marquis de Guadalupe, whose protestations were obviously ignored (Bertrand nevertheless cites him as a distinguished member of the Order in his 1960 history; see Leone Castelli for Guadalupe's protestations). Yet the order was being actively denounced: the French heraldist and genealogist Jougla de Morenas called it a fraud, and is quoted as saying: "the least advised of our Parisians laugh at these baubbles which no one wants, and the knights must mostly be foreigners". Paul Watrin ceaselessly fulminated against his former friends and violently denounced Otzenberger, who now calls himself "comte". Most significantly, the Holy See prints the first in a series of denunciations of the false order in l'Osservatore Romano in April 15-16, 1935, to no avail. In the pages of the Italian journal Rivista Araldica a controversy over the order rages in 1934-37. According to Leone Castelli, on July 2, 1940 the duke of Seville decreed that the management of the Order would henceforth be taken over by a member of the Supreme Council residing close to him, and appointed the marquis of Cardenas de Montehermoso in Madrid; and, on June 25, 1941 he relieved of their duties the leaders of the French Priory, namely Otzenberger and his crowd. La Vie Chevaleresque ceased publication in october 1939, presumably because of the war. La Science Historique disappeared the same year. Paul Watrin revived it after World War II and then passed it on to a new generation of legitimists (it still appears nowadays, although irregularly; the Soci�t� is headed since 1981 by Philippe Montillet). World War II witnesses the first charitable activities of the Order, mainly involved in providing first aid after bombing raids (at least the first ones ever mentioned by Paul Bertrand): after collecting fees from new knights for 30-some years, that does not seem a moment too soon. Whether any of that money ever made to the Orient as claimed, I don't know. According to Chaffanjon and Zeininger, Bertrand was involved during the Occupation years in an Order of the Crown of Charlemagne. I have found no further information on this, but the name itself makes any Frenchman shudder (under the Nazi occupation, Charlemagne was a symbol for the new Nazi order in Europe, and the French volunteers in the Waffen-SS were called the Charlemagne Legion). Zeininger also recounts how Otzenberger established cosy relations with the German occupant. After the War, there was some renewal of the leadership. Paul Bertrand's 1960 history says that he and Otzenberger had been made Administrators General of the order by the Grand-Master and that, once cut off from him after 1940, managed the order on his behalf. No mention is made of the decrees cited by Leone Castelli. At the liberation of Paris in August 1944, Otzenberger was arrested because of his commercial dealing with the German occupant. He was freed, then arrested again by a "communist-leaning militia" and died in October 1944 of foot gangrene. L'Église de Ferrier, "tired", resigned as president of the French association and was replaced by the prince de Chalais (1944-47) and then by the duc de Brissac. Bertrand remained active in the Order: at some point between 1945 and 1951, he took to calling himself Bertrand de la Grassière, under which name he published various works of genealogy and history, as well as technical articles on maritime law. He stayed on as Grand Capitulary, and he became interim Grand Prior of France in 1948, replaced in 1954 by Pierre de Cossé, duc de Brissac (1900-95). The duke of Seville died in 1952; his son became Lieutenant General and in 1959 Grand Master. Brissac was made Administrator General in 1956. The Order was once again patronized by the Melkite patriarch in 1965. The official history of the order since 1960 is chronicled in various places, including the Web Page of the Grand Bailiwick of England and the Web Page of the US Grand Priory. The same tensions which had arisen before World War II between the Grand Master in Spain and the administration in Paris surfaced again. In the end, the duke of Seville was deposed in 1967 by the French administration and replaced by the duc de Nemours (of the Orléans family). In the 1960s, a Briton named Robert Gayre had succeeded in founding a branch of the Order in Great Britain, accepting many non-Catholics as members. (The same Robert Gayre was involved in a particularly grotesque episode occurred in the mid-1960s, when an International Commission on Orders of Chivalry was created, with the main purpose of providing legitimacy to the Order of Saint Lazarus.) The duke of Nemours decided to open the order to them, but this led to another split, and Nemours was himself deposed and replaced by the duc de Brissac who, in 1980, abandoned the denomination of "Order" and gave the association new statutes, calling it simply "Hospitallers of Saint Lazarus" (thus avoiding difficulties with French laws against illegal orders). Meanwhile, the factions supporting the duke of Seville and the duke of Nemours subsisted. Nemours was succeeded at his death in 1970 by Michel d'Orléans (a son of his kinsman the comte de Paris), whose supporters reconciled in 1973 with the Seville faction in 1973 under the direction of the duke of Seville (Michel d'Orléans left the order in 1976). They established their headquarters in Malta. An attempt at merging the two factions failed in 1986, and resulted in another split, with factions of the same name (Paris versus Seville) but a slightly different composition. As a result, there are in various countries competing versions of Saint Lazarus. When meeting a knight of Saint Lazarus, you may need to inquire about which obedience they belong to... In Britain, the Grand Priory (Paris flavor) is headed by the duke of Westminster, while the Grand Bailiwick (Malta flavor) is headed by Arthur Craddock. In the US, the Grand Priory (Paris flavor) is headed by Hans von Leden while the Bailiwick of the United States (Malta faction) was headed until 1999 by Roger Sherman of Castlemore. (It appears that the latter organization has recently become a Commandery of the former, but each retains its loyalty ot its own grand-master "on the international level"). The Order's charitable activities have considerably increased after World War II. Many of those are carried out by a non-profit organization called the Lazarus Hilfswerk, in Germany, which has its own Web page (in German). It is a registered charity under German law, and has been active in the late 1980s and 1990s in Eastern Europe and in Russia. It is associated with the Paris branch, being under the "immediate protection" of the duke of Brissac. The Holy See has repeatedly stated that it does not regard the present-day Order of Saint Lazarus as the continuation of the historical order by that name. It has denounced the order by name as a fraud, first in a lengthy note in L'Osservatore Romano in 1935, then again in 1953 and 1970. To this day, the Holy See has not changed its position. The Italian government has placed the Order on its official list of bogus orders. The Sovereign Military Order of Malta discourages its members from joining the Lazarists. The French government, which regulates orders and decorations, does not recognize it as an order either, and its official position remains that the last knights of the historical order were nominated in 1788, that the order was abolished in 1791 and never officially revived. Under threat of prosecution, the Paris branch of the Lazarist organization has in fact changed its name, ranks and insignia to comply with French law in 1980. There isn't a government on earth that recognizes the order, save perhaps the Franco government in the 1940s, and, it is now claimed, Croatia and South Africa. There is no doubt in my mind that the present-day Order of Saint Lazarus is an early 20th century private revival of a defunct order. The original Order's French branch, having resisted Papal decisions, had become a royal order in the 17th century, and just as clearly its last Grand Master, once on the throne, purposefully let it disappear. No new appointments were made after 1788 and the last original knights died off in the 1840s. The revival took place around 1910, and is due to a strange coalition of French legitimists with a couple of experts in fake orders. The crooks dropped out of the picture at various dates, but the order continued. Its growth presents an amazing parallel with that of the fake Order of Saint George which involved some of the same people. Of course, the Order has changed since then, and these unsavory origins have little bearing on the value of the Order's present-day activities, which is undeniable. But those who attach paramount importance to the notion of "legitimacy", indeed anyone who claims that this Order is the Order of Saint-Lazarus has to face the evidence. In my opinion, this order fully deserves the label of "self-styled". It has a definite role as an honourable charitable organization, and may even invoke the model of the hospitaller activities of the historical knights of Saint Lazarus as an inspiration. But whenever it tries to pass itself off as the Order of Saint-Lazarus, claiming to be in the same position vis-a-vis the historical order of that name as the Sovereign Order of Malta is vis-a-vis the historical Order of Saint John, it is perpetrating a fraud. Paul Bertrand: Histoire des chevaliers-hospitaliers de Saint-Lazare. Paris : Editions du Chancelier, 1932. Paul Bertrand de la Grassière: L'Ordre Militaire et Hospitalier de Saint-Lazare de Jérusalem. Paris; Peyronnet, 1960. This is the "official" version of events by the Chancellor/Grand Capitulary of the "Order". In fact, I've found it to be fairly reliable where simple facts are concerned, except that his research improved somewhat between the two books. But anything that has to do with the 19th century history must be read with great care. Much information has been gleaned from the issues of La Science Historique, vols. 1-17, 1921-29 owned by the University of Minnesota library (I have not found later volumes). It was the official mouth-piece of the revived order in that period. A different angle is provided by the curious book by Nanni Leone Castelli: La Estafa de San Lazaro, Mexico City: Genio Latino, 1944 (the title translates to "the Swindle of Saint Lazarus"; Castelli was an Italian journalist, former "futurista" turned anti-fascist, who moved to North America in 1921 and settled in Mexico in 1926; see Angelo Principe, The Darkest Side of the Fascist Years: The Italian-Canadian Press, 1920-1942, 1999, pp. 44-46). It discusses some of the more unseemly details of the order's history in the 1920s and 1930s. The revival of the order led to interminable polemics in the Italian journal Rivista Araldica in the years 1934-37, in which Paul Bertrand and the marquis Adriano Colocci-Vespucci (under his name as well as the pseudonym of count of Rovigliano) defended their version of the history of Saint Lazarus. None of these articles offers any more evidence than is contained in Bertrand's books. Earlier issues of the Rivista Araldica (1913, pp.678-83, 1914, 221-2) provide details on the circumstances of the revival. See also the references in Zeininger's 1953 article. H.C. Zeininger de Borja, "L'Ordre de Saint-Lazare". Hidalguia (1953) 3:501-32. The most detailed summary of the revival and its connections to other false orders and fraudulent activities. marquès de Villarreal de Alava, "Las Falsas Ordenes de Caballeria", Hidalguia (1953) 3:533-620. Philippe du Puy de Clinchamps: La Chevalerie. Paris, 1961; Presses Universitaires de France (p.112-7). Hervé Pinoteau: article in La Tradition française, no 10, nov 1964; reprinted in his book Études sur les Ordres de Chevalerie du Roi de France, Paris, 1995; Le Léopard d'Or. The two branches of the modern Order have joined forces to share a web site. Guy Stair Sainty has devoted a page to the Order of Saint Lazarus on his Web site. A serious history of the original order (before the 19th century) is Eugène Vignat: Les lépreux et les chevaliers de Saint-Lazare de Jérusalem et de Notre-Dame du Mont-Carmel. Orléans : H. Herluison, 1884. Since Vignat is a local historian interested in nearby Boigny, he has no axe to grind and is reliable. Another excellent history is René Petiet: Contribution à l'histoire de l'Ordre de Saint-Lazare de Jérusalem en France. Paris, 1914; E. Champion (who knows nothing of the modern revival). An official history up to the 18th century by the historiograph of the order is Pierre-Edme Gautier de Sibert: Histoire de l'ordre militaire et hospitalier de Saint-Lazare de Jerusalem, Paris 1772 (reprint Geneve-Paris : Slatkine, 1983). A complete list of the knights of the Order of Saint-Lazare and Notre-Dame du Mont-Carmel from 1608 to 1788 with, in most cases, the proofs of nobility, can be found in Henri-Melchior de Langle and Jean-Louis de Treourret de Kerstrat: Les Ordres de Saint-Lazare de Jérusalem et de Notre-Dame du Mont-Carmel aux xviie et xviiie siècles. Paris, 1992; Collection SRHN. Their introduction provides useful information on the institutional history of the order, changes in regulations, etc. The book is poorly edited, however, with glaring typos. See also a summary listing of all members of French orders in Colleville, Ludovic, Comte de: Les Ordres du Roi; Paris, 1924: Jouve. On false and self-styled orders, a fascinating account is in Arnaud Chaffanjon and Bertrand Galimard-Flavigny: Ordres et contre-ordres de chevalerie. Paris, 1982; Mercure de France (there is a chapter on Saint-Lazarus). On contemporary French royalism (for Watrin's role in the history of that movement), see Patrick Louis: Histoire des Royalistes; Paris, 1994; Jacques Grancher. Personal information on Paul Bertrand from the French Who's Who, 1977 edition. See also the official history of the revived Order.